The parents of teacher Lindsay Ann Hawker who was murdered near Tokyo almost a year ago are to fly to Japan to renew their hunt for her killer. 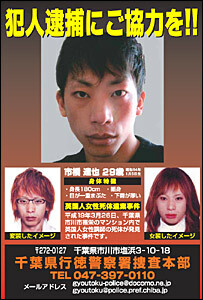 It comes as police released posters of suspect Tatsuya Ichihashi showing how he might look if disguised as a woman. He has not been seen since fleeing the flat where Miss Hawker's body was found in a sand-filled bathtub last March. Miss Hawker, 22, of Brandon, near Coventry, had arranged to meet Mr Ichihashi to teach him English. The family's spokeswoman said the parents hoped their trip would raise the profile of the murder investigation. They are due to fly to Japan on Easter Sunday and give a press conference the next day. 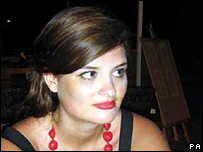 Leeds University graduate Miss Hawker had gone to Japan to teach English. She had arranged to meet Mr Ichihashi in a coffee shop but she never returned home and her body was later found at his apartment. Police said her hair had been cut off and believe she was subjected to a prolonged attack. When police arrived at the flat in Ichikawa, east of Tokyo, the suspect fled, losing his shoes and a rucksack in a chase. Detectives are considering the possibility that the 28-year-old had evaded capture since by disguising himself as a woman. Posters distributed around Tokyo show how he might look with dyed blonde hair or as a long-haired woman. About 4,000 posters and 30,000 flyers with the new pictures are to be distributed.